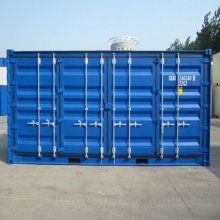 Looking for shipping containers for sale in Perth? If one of our new build containers straight from the manufacturer is within your price range, we encourage you to invest in one. When looked after well, a newly purchased sea container can hold its resale value for years. You will not only get years of use out of it, you will have an asset that is relatively valuable when the time comes to upgrade again. Alternatively, we have second hand containers for sale from a diverse network of suppliers including shipping lines. These second-hand models have been tested and inspected for quality and condition, and can safely be used for a variety of applications. Shipping containers are designed to safely transport cargo or freight whilst being exposed to the wear and tear of months at sea. It's a hard life for containers as they are moved from port to port, ship to ship, loaded and unloaded and stacked up high. It's not uncommon to come across a sea container that is more than 10 years old nor any surprise that their durable, scalable nature has been used in residential, commercial and industrial applications such as for storage or portable workshops. They are fast becoming popular as outer shells for site offices, sustainable homes and much more; they’re also great to use as long term storage on your premises, should local regulations allow. If you would like specific advice on sourcing and using a container for a particular special project, please feel free to contact us. Inspect the interior and exterior walls for damage. Chipped paint from cranes or forklifts can eventually cause rust spots. Step inside the container, close the doors and see if light comes through any holes. Make sure there's someone there to let you out! While you are there, can you smell mould? There may be leaks or spilled cargo contents. Test both doors, do they open all the way, easily enough for your access requirements? Do the doors close easily and seal tight? Can you secure the locking mechanism?